We are happy to share with you minor update of our solutions for Monitoring Docker, Kubernetes and OpenShift. 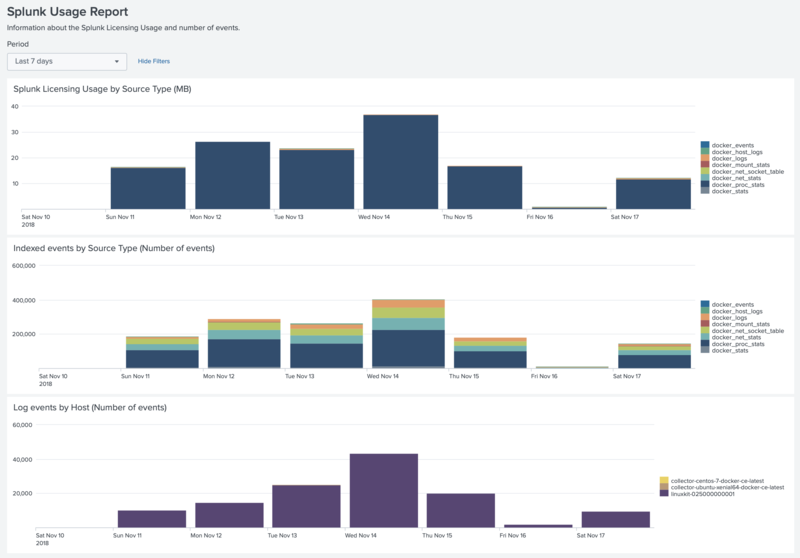 This update brings improved capabilities for monitoring multiple clusters within one application, better observability for the state of the forwarding data, also insights into the Splunk Usage. If you need to hide sensitive data (to hide PII data and be compliant with GDPR) we suggested to use the replace patterns so that you can replace IP addresses with static values like X.X.X.X. But that can complicate observability if you want to see the trace, or see all the requests from the specific IP address. Now, by using hashing functions you can get the same values for the same IP addresses, so that can help you to identify similar values. With the annotation logs-hashing.1-match you can specify a match regexp. Default hashing function is sha256. So the resulting hashing value can be larger than the source value. EsoXtJryKJQ28wPgFmAwoh5SXSZuIJJnQzgBqP1AcaA - - [18/Nov/2018:01:25:27 +0000] "GET /404 HTTP/1.1" 404 153 "-" "Wget" "-"
qrr-cQTZFL4 - - [18/Nov/2018:01:27:17 +0000] "GET /404 HTTP/1.1" 404 153 "-" "Wget" "-"
In that example annotation logs-hashing.1-match applied only to the nginx container, and logs-output to get-trigger container. collectord.io/logs-disabled - completely disable log processing. The difference with the logs-output=devnull is that in case of devnull output Collectord still reads the logs, so if you change the output later, Collectord will start processing logs right from the moment when you changed the output. In case of changing disabled=true to false Collectord will start forwarding logs from this container as this is a new container, starting from the beginning of the log files. We have added several alerts, that can help you to troubleshoot issues with Collectord. Alerts to show when Collectord reports errors in the processing pipeline, for example when it fails to extract the fields. Alert for showing when Collectord reports Warning messages, that can identify issues with the access to API Server, or that not all the requests to Splunk HEC can be delivered from the first time. The third alert is about the lag between the time of event and indexing time, this alert can identify issues with the performance of Collectord or Splunk Indexing pipeline. We improved identification for the events, that we already sent to Splunk. That allows reducing amount of events Collectord forwards to Splunk. In a very high number of events that can be a significant change. We have found that this grouping can reduce licensing cost of network socket table data in 4 times. You can also see how much licensing cost is taken by the application with the Splunk Usage dashboard. With version 5.3 we significantly improved memory usage and improved log processing performance improvement. You can see the result in separate blog post Performance comparison between Collectord, Fluentd and Fluent-bit.